Three is the new four as two automakers make big news with little three-cylinder engines with the displacement of a soda bottle. Indeed. Although these itty-bitty engines are extreme, they underscore the auto industry’s trend toward smaller engines. Engines will only get smaller as automakers scramble to hit corporate average fuel economy standards expected to reach 54.5 mpg by the 2025 model year. Automakers have experimented with three-cylinder engines before — the Geo Metro of the 1980s had one, for example, as did the VW Lupo city car — but they were as boring as they were thrifty. The big problem with small engines has long been mediocre performance, but the adoption of turbocharging, direct injection, variable cam timing and other tricks ensures decent, if not stellar, oomph. Ford, for example, boasts that its little three-cylinder will perform like a 1.6-liter four. 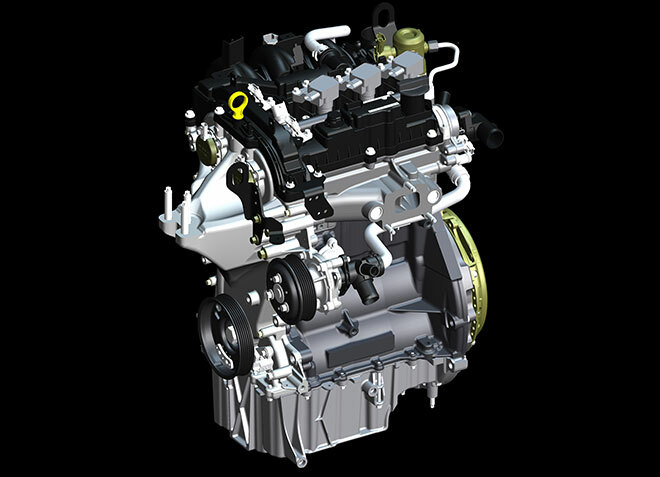 “All of this technology allows you to generate the same power with a smaller, more fuel-efficient engine,” Fedewa said. The trend is becoming common in midsized sedans, which traditionally have featured V6 engines. Hyundai, for example, shook it up when it offered only four-cylinder engines in the Sonata. Audi has done the same with the the A4, and General Motors will do so with the Malibu. But we’re also seeing it in trucks. Ford says roughly 57 percent of the F-150 pickups sold during each of the past four months had V6 engines. The EcoBoost V6 offers performance similar to the V8 but 18 mpg (combined) against the V8’s 14. It wasn’t too long ago that you’d be hard pressed to find an F-150 that didn’t have a V8. The bottom line, analysts say, is consumers are increasingly concerned with fuel economy and driveability, not the size of the engine. If a smaller engine provides better fuel economy and performance on par with a larger one, they’ll buy it. There are benefits beyond fuel economy for automakers, too. Smaller engines obviously require less space, leaving more room for the electronics and motor needed for a hybrid drivetrain, or for the seven- , eight- and even nine-speed transmissions automakers are using to further increase fuel economy. Smaller engines also are lighter, and cutting weight is one of the best ways to increase efficiency. Ford says its itty-bitty turbocharged direct injection engine will produce 118 horsepower and 125 pound-feet of torque. That’s impressive, because Ford’s four-bangers typically deliver 70 ponies per liter. The engines are slated to appear in Focus, C-Max and B-Max models in Europe next year. Ford’s engineers at Dunton Technical Centre in the UK focused on minimizing friction and maximizing efficiency while designing the engine, which has racked up more than 447,000 miles in testing. It features a one-piece exhaust manifold and cylinder head, a trick Ford says reduces exhaust gas temperatures and allows the engine to run at the optimal fuel-air ratio across a broader part of the power band. The engine block is cast iron because it requires half as much energy as aluminum to warm up. A “split cooling” system lets the block warm up before the cylinder head, so the engine reaches operating temperature faster. VW wasn’t so forthcoming with details, but said the CNG engine in the eco Up! concept is good for 67 horsepower. Not much, but adequate for a city car. It emits 86 grams of CO2 per kilometer and gets the equivalent of 73 mpg. Adding the “BlueMotion” technology — stop-start tech and regenerative charging of the battery — cuts emissions to 79 g/km. VW said the eco Up! “will have long been on the road as a production vehicle” by the time next year’s Frankfurt show rolls around. The Up! is almost as small as the engine propelling it. It’s just 104 inches long, or roughly the size of the Fiat 500, with room for four people and 8.9 cubic feet of cargo (33 with the rear seats down). Three-cylinder engines will become increasingly common in Europe — where gas costs the equivalent of $8 or more a gallon — and Asia, but it remains to be seen whether we’ll see them here in the United States. All eyes may be on Ford when if and when it brings the three-cylinder Fiesta, or possibly a Focus, over from Europe. “If Ford is successful, we might see VW and others bring them to the United States,” Omotoso said. And if you think a 1.0-liter engine is small, consider this: Fiat, for example, is offering the adorable Fiat 500 in Europe with a tiny 875-cc, two-cylinder engine said to be good for 57.4 mpg. Photo: Volkswagen. 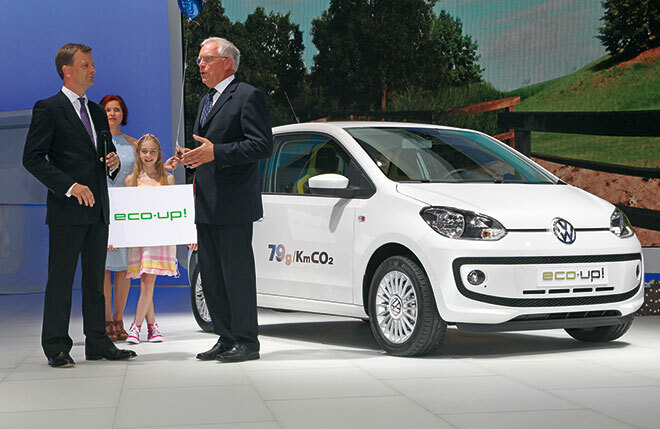 Peter Thul, head of communications at VW, and board member Dr. Ulrich Hackenberg with the eco Up!